Paint Grand Traverse - Featured Artists Announced! A celebration of student artwork in the Char-Em ISD. Join us as we honor Youth Art Show winners & students who are graduating or receiving scholarships. Celebrating the opening of the "Bodies of..." ceramics exhibition. 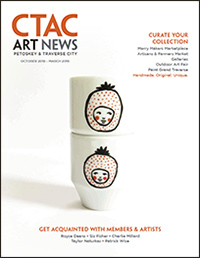 Read the latest edition of Crooked Tree's Art News! Founded in 1971, Crooked Tree Arts Center - Petoskey features four galleries, a theater, dance studio, classrooms, a culinary arts kitchen, and much more. We are located in downtown Petoskey, and our galleries are free and open to the public Monday - Saturday. Crooked Tree Arts Center - Traverse City is located just steps from downtown, on historic Sixth Street. We offer year-round art exhibitions and classes for all ages. Our gallery is open seven days a week through the summer, and admission is always free and open to the public.